According to Maya myth, knowledge of backstrap loom weaving was revealed to the first woman by the goddess Ixchel, female deity of the Moon, Water, Weaving, and Childbirth. Since then, the intricate art has been passed down from mother to daughter for generations. In reality the tradition is believed to go back about 2,800-3,000 years. In ancient Maya civilization, weaving was considered not just a women’s activity but also a noble activity, with the elite having access to the most expensive and colorful garments. Traditionally, young Maya girls learn to weave at around 8 years old, but as girls begin to attend school in modern day Guatemala, fewer sit at their mother’s knees to learn the art of backstrap weaving. However, plenty of Mayan women still partake in the laborious but rewarding art form. Typically when a Maya girl is preparing to marry, the groom’s family will request that she make a tzute, or multi-purpose garment made from one or two panels. Its uses include carrying goods, shading the head, carrying a child, and providing extra warmth. A Maya woman can wrap two or three tzutes around herself to better secure a baby. Intricate, multi-design tzutes such as those shown below can take, on average, six months per tzute for a skilled weaver to make. The backstrap loom is a deceptively complex design that has survived practically unchanged since ancient times. Plant fibers, such as those gleaned from maguey and cotton plants, were the only fibers available before contact with the Europeans, who brought wool and leather. Backstrap weaving is unique in being able to produce four finished selvages, or woven edges. This is accomplished by weaving a few inches at the beginning, turning the loom, and weaving all the way up to a small gap that is then finished using an umbrella spoke or needle. A beautifully finished termination area confirms the patience and skill of the weaver. Some weavers do not cut the loom, leaving the warp ends dangling, which can then be twisted or knotted into a decorative fringe. Shortly following colonization, the Spanish introduced floor looms and forced Maya into workshops to provide textiles for export and as tribute to the crown. Many floor looms today have been in family households for generations, some taking up an entire room. The original Spanish system had men weaving on floor looms, but today Maya women sometimes take over a family floor loom when the men die or leave to find work. Some may even purchase their own. Floor looms greatly speed up the weaving process and produce longer, wider pieces with more uniform results, as a backstrap is more sensitive to the weaver’s creative impulses, and so relies more on the skillfulness of the weaver. A woman’s upper garment is called a huipil. It is a rectangular top made of up to three panels woven together, with an area cut out or left open for the neck. Everyday huipiles are stitched up the sides to create armholes, while ceremonial huipiles are worn over other clothing and the sides are left open. A huipil is a fine testament to a weaver’s skill and personal design preferences. Their neck embroidery is more varied in design, color, and material than other garments. The availability of new dyes and weaving materials from the late 19th century forward brought about an explosion of color, designs, and decoration. Acrylic yarn joined wool and cotton for weaving, along with synthetically dyed and metallic thread. San Antonio Aguas Calientes huipiles are considered to be exquisite by collectors as well as many other Maya. One can be seen below. A corte, or skirt, is a practical garment and is made to fit all sizes and stages of a woman’s life. Most cortes are wrapped around the waist and secured with a belt, or faja. Others are secured by a simple tuck at the waist as in Santiago Atitlan. Jaspe, or ikkat (a borrowed Malaysian word used to describe threads formed by binding individual yarns or bundles of yarns with a tight wrapping applied in the desired pattern, that are then subsequently dyed) was introduced by the Spanish. They were produced for specific communities on floor looms in highland weaving centers such as Quetzaltenango and Totonicapán, as they are today. Some weavers keep the traditional dark red color, used widespread across Guatemala, and add sparkle to their weaving. Others use sparkle with new colors. A Spanish edict in 1563 prohibited the use of gold and silver or imitations of them by the Maya, but recent fashion trends have brought them back. Younger women are experimenting with other corte designs, though they still prefer a gathered skirt. In some communities the seam is finished with colorful embroidery called randa. A morga is another early skirt style still in use. Floor loomed with heavy denim-like material, it was originally indigo from natural dye. Today’s are colored dark blue with chemical dye. The morga is still used in a few communities around Atitlán. 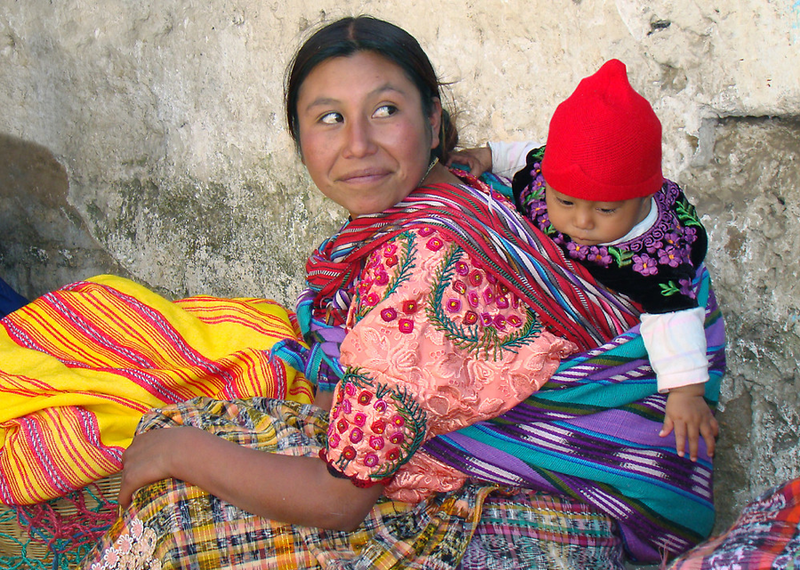 In Todos Santos Cuchumatán, most women wear a morga that includes a few light blue stripes. Chichicastenango indigo morgas have decorative lines. Today it is the shortest skirt in all the highlands and sometimes uses fine jaspe or metallic thread lines. Hair ribbons, or cintas, were produced in several regional centers. Even at the beginning of the 20th century when colored yarn was expensive and its use more limited in huipiles and cortes, cintas stunned foreigners with their color and intricate designs. They are my personal favorite aspect of the Maya woman’s traje. They can be partially wrapped around the head and let to hang down from the hair, braided into the hair, or completely wrapped around the head to create a brilliant halo, shading the woman’s face from the sun. Any way in which a woman decides to wrap her hair, she tells a story with its design. Their versatility and colorful contrast with the glossy black hair of the Maya make them a delight to see. These days, Maya women have been incorporating other communities’ huipil and corte designs into their daily wardrobe, however cintas are one of the few items that may give someone an idea of which town a woman is originally from. In many villages, a woman’s cinta is an indicator of whether she is single, married, a matriarch, has children, etc. It is far and away considered the most dazzling aspect of a Maya woman’s outfit. The magical textiles of Guatemala are among the most underrated contributions to modern day couture that exist. For years, clothing chains such as H&M, Forever 21, Urban Outfitters and countless others have been going on rampages adopting the sacred designs and weaving techniques of Maya women without acknowledging their labor and ingenuity. Skip out on the appropriation fest of Fast Fashion stores and head to Guatemala for the real thing. Though the surreal beauty of Mayan garments is in danger of disappearing, there are still many skilled, passionate weavers who take pride and joy in meticulously creating their gorgeous customary dress for people from all around the world to purchase and enjoy.